Mahabaleshwar and nearby regions grow strawberry and most of the farms offer a free farm visit to tourists. This isn't really free as most of the visitors end up buying strawberry ice creams/fruits/plants or other products from farm, spending at least a few hundred rupees per head. We visited one such farm + shop. It was located on the way to Kate's Point in North Mahabaleshwar. Below are some photos of strawberry farm and some key information about strawberry that was explained to us. We were told strawberry plucking season is between Jan to May. As you notice in the pictures, a layer of plastic is added between the plants and ground, to prevent strawberries get spoiled by coming to contact with soil, moisture etc. In the farm we visited, we had one strawberry cream, 3 parathas, 2 boxes of strawberries and 2 strawberry plants. The bill was Rs 460. Maharashtra reportedly produces 30000 tonnes of Strawberry every year, worth about 100 crores. This is reportedly three fourth of India's strawberry produce. 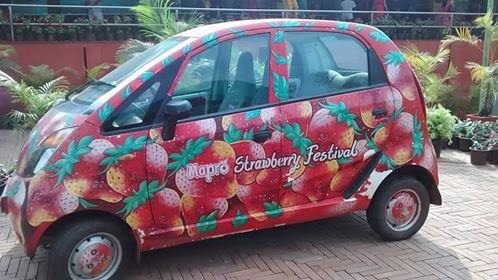 Strawberry festival is also conducted in Mahabaleshwar/Panchagni in March. We stopped for sometime at Mapro factory campus where this strawberry flavor Nano was on display. Can you give me contact details of the farm? I don't have contact details of the farm. It is on the way to Kate's point. Hi Nidhi...is Jan mid a good time for strawberry picking? ?